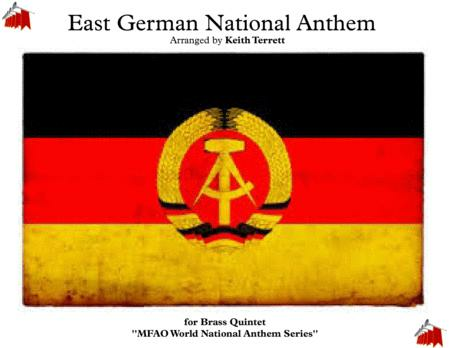 An arrangement of the old East German National Anthem. When a country disappears, its national anthem goes into limbo, condemned to purgatory for pomp and circumstance: instead of full orchestral treatment, the uplift of a brass band, or the quasi-religious affirmation of a massed chorus, the melody hums to itself forlornly in the darkness—no flag to hoist, no adoring populace to salute and shed a nationalistic tear, no troops to stand at attention to its heroic strains. The greatest of these national hymns, that of the so-called German Democratic Republic, has been banished from glory now for twenty years: “Aus Ruinen Auferstanden” (Raised out of the Ruins) with music by Hanns Eisler, one of the most wide-ranging, prolific, and provocative musicians of the 20th century. Although I loathe nationalism, I hold a fascination for its central symbols, the flag and the anthem. Eisler’s is the best of them all. This coming Wednesday, October 7, the GDR would have celebrated its 60th anniversary and many would have been the chances to hear Eisler’s anthem. For the lifespan of the forty-year “republic” it was his most famous creation. Born in Leipzig 1898 into a family of with socialists going back two generations and raised in Vienna, Eisler served in a Hungarian regiment in World War I. The eexperience brought forth bitter, anti-war gallows songs from his pen. After the war he studied with the visionary modernist Arnold Schönberg in Vienna, though he eventually broke with his teacher over questions of the elitism of complex musical techniques and over Eisler’s belief in the political power and indeed obligations of music and its creators. Eisler moved to Berlin in 1925 and joined the Communist Party a year later. In these years he also visited the Soviet Union, composed many socialism classics that now lie disused in an adjacent purgatory to that of his GDR anthem: the Kominternlied, Solidartiätslied and Einheitsfrontlied (Song of the United Front). In these works, Eisler demonstrates his mastery of the rousing phrase, the forward-marching harmony. Like no other composer, he makes it seem that ineluctable force of history is on the side of his music. His socialist songs carry the red banner without faltering for a single beat. Eisler’s lifelong friendship and collaboration with Bertolt Brecht began in 1930. The composer’s vision of himself and his music is reflected in the premiere of the Brecht/Eisler didactic oratorio, Die Massnahme in Berlin in 1930. Rejecting the division that placed the composer far above the performer, Eisler unobtrusively joined in the chorus. Has such a graceful move been repeated by other composers in the thrall of the “great man” theory of musical progress? The followg year Brecht and Eisler worked together on the film Kuhle Wampe (subtitled To Whom does the World Belong) with its bleak vision of the depredations of global capitalism. The final scene, directed by Brecht, in which a spirited discussion of the immorality of international coffee market takes place in a full tram car is unlikely to screen in a Starbuck’s near you. The argument between the passengers seems to end with a general feeling of impotence at the global forces, the initiator of the debate claiming that no one can change the world. At last a young woman speaks up: “I will change the world!” she says softly but firmly. This promise introduces the Solidaritätslied accompanying shots of the masses, seen from the back, as they funnel relentlessly into an underpass: the song’s determined bursts of melody marches along on sooty Elgarian boots and is interspersed with tenor solos that sound imported from the smoky world of Berlin’s Cabarets, to which Eisler was also a frequent contributor. The Solidartiätslied combines the massed hymn with the committed personal utterance. No one did the ideological song as compellingly, prolifically, and with as much sense of optimism, as Eisler. Kuhle Wampe was immediately banned by the Nazis when they came to power the year after its release. Like so many others, Eisler and Brecht fled Germany; after stays in Moscow, London, Madrid, and Paris, they eventually found their way to Hollywood. Together Brecht, he worked together with fellow refugee Fritz Lang on Hangmen Also Die, a semi-fictional film, part crime drama, part propaganda piece, about the assassination of the SS Reichsprotector of Bohemia, Reinhard Heydrich in 1942. In the book Eisler coauthored with another German refugee, Theodor Adorno and funded by the Rockefeller Foundation, Eisler singled out his “rat” music—high, scrabbling string figures—that accompanied a single, short shot of Heydrich on his hospital bed, not yet having succumbed to his wounds. Eisler was making sure that the SS Hangman would not be granted a drop sympathy nor anointed with the tiniest bit of heroism. Eisler’s account of this passage was a testament to the power of music even given only a few seconds to discharge its mission. Eisler duly dashed off another nationalist rouser for the movie’s closing hymn that conveys the solidarity of the Czech people against the Nazi oppressors. Eisler committed himself to major works, like Die Massnahme and later the Deutsche Sinfonie with poems by Brecht, the genesis of which spanned two decades and which received its premiere fifty years ago at the Berlin Staatsoper. But Eisler deployed his art with just as much force in the shortest of spans, where it too could be instantly effective, indeed lethal. Eisler received an Academy Award nomination for his Hangmen score.What astounds most throughout Eisler’s career, but especially in the oppressive and opportunistic Hollywood is his compositional range: who else in the history of 20th-century music could finish off Heydrich in a few seconds and then five years later write ironic rococo pastiche for Douglas Sirk’s period melodrama Scandal in Paris of 1947? But the same year that he was working on Hangmen, effectively producing propaganda for the war effort, Eisler had gained the malevolent attention of J. Edgar Hoover. The FBI file on Eisler is 686 pages, and the dossier shows that the director himself took a kean interest in the case, asserting from the outset that the composer came to America as an agent of the Cheka not a film composer. Hoover dispatched his FBI staff to translate and offer interpretationsof Eisler’s complete works, in what amounts to the greatest single effort in Eisler scholarship ever undertaken. The G-men’s judgment was not favorable to the composer’s chances of staying in the country. Stripling: The purpose is to show that Mr Eisler is the Karl Marx of Communism in the musical field and he is well aware of it. Mr. Stripling: Haven’t you … said, in effect, that music is one of the most powerful weapons for the bringing about of the revolution? Mr. Eisler: Sure … The truth is songs cannot destroy Fascism, but they are necessary. It is a matter of musical taste as to whether you like them. I am a composer, not a lyric writer. If you don’t like them, I am sorry. Stripling: You have written a lot of songs, Mr. Eisler, have you not? Eisler: I have written not only songs, but I have written everything in my profession. Here is a book printed by a subversive organization, the Oxford University Press [He indicates Composing for the Films], but I couldn’t say that I am a member of the Oxford University Press. After nearly a decade in the United States, Eisler arrived back in Berlin in the Soviet Zone a year before the founding of the GDR. In August 1949 he was in Warsaw with the poet Johannes Becher, later East German Minister of Education. Surveying the ravaged city, a melody came to Eisler. The next afternoon the pair visited Chopin’s birth house, and there, on Chopin’s own piano, Eisler played what would become the national anthem for the man who had subsequently write its lyric. Less than two months later the Eisler/Becher hymn was declared the national anthem of the GDR, and received its first performance on November 7, 1949. In the 1950s Eisler would run afoul of the GDR regime for his opera Johann Faustus, which took a revistionist view of the story as one of betrayal to the cause of the Peasants’ War. However, ideologically plausible this interpretation was, even the GDR President Walter Ulbricht decried Eisler for having “disfigured the work of our great German of our, Goethe.” Too often for his own comfort, Eisler composed against the grain. For the forty years of their parallel existence of the East and West Germany the states boasted the two best national anthems. It was only fitting that the two halves of the country claiming the greatest composers (Bach, Beethoven, and Brahms) should compete in this way, too. With the demise of the GDR almost all its cultural and political accessories were buried along with it. Only a few things East German things survived reunification, like the children’s television program Das Sandmännchen. One can understand the impulse to purge the past. Yet the West German anthem, with music by Joseph Haydn for the name day of Hapsburg Emperor Francis II, was much more severely poisoned by its past. Miraclous or crazed, depending on how you see these things, is the anthem’s survival even after its appropriation by the Nazis. It is not just nostalgia for the sight of a hormone-addled East German female weightlifter enjoying her Olympic glory atop the winner’s platform that makes me think the Germans chose the wrong anthem for their reunified state. Haydn’s is good. It projects majesty in every line. But Eisler’s is better for the way it alternates passages of general euphoria fuelled by shared purpose with a disciplined determination representing the harsh realities and responsibilities of state building. Eisler’s anthem combines the style that yielded so many socialist hits of the 1920s with the surging pomposity of the German symphonic past. It makes you want to rise to your feet, to grab a hammer or a rifle, and keep singing. In short, it does everything a national anthem should do. Down at the bottom of the international rankings of national anthems, dragging along with the similarly dire world position of its “healthcare system,” is the United States. The American national anthem was ceded to an Anacreontic tune that, true to its origins, veers drunkenly beyond any reasonable vocal range and a stumbles through its melodic obstacle course as if it had several glasses of wine too many. Let us plough and build our nation,learn and work as never yet,that a brave new generation,faith in its own strength beget!American youth, for whom the strivingof our people is at one,you are America’s reviving,and over our America,there is a radiant sun,there is a radian sun. Hanns Eisler, I invite back you to American shores!